Man what a day on the bike! It started off a bit early, I needed to wake up so we could get everything packed and ready to go. Plus we needed to get down here early enough to ride. It wasn’t a bad drive at all in fact it felt more like a 45 minute drive than a two hour plus drive. Probably because I was half awake and kinda out of it but it went by fast for me and thats what counts. Once we arrived we wasted no time getting the bikes out and getting the ride started. At first it was a bit nippy, which was largely due to the head wind. However, once we finally got settled in it got a lot better. 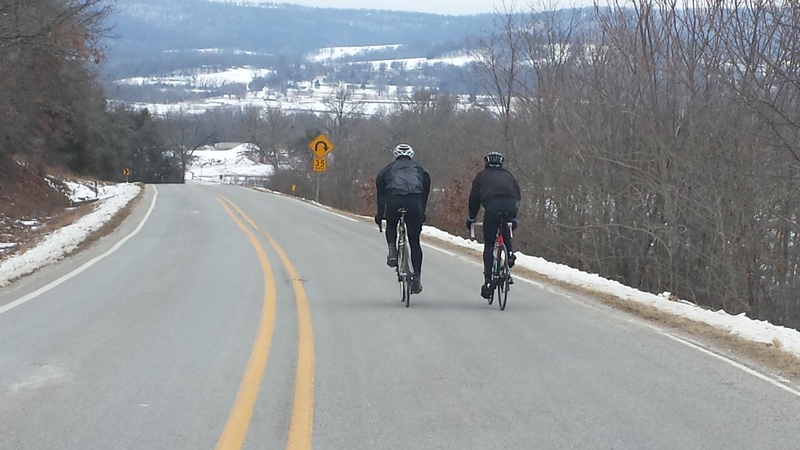 Mr. Kent Woermann decided he would ride with me, I mean how could he pass up riding in Arkansas when KC is full of snow? It was cool to have him here because it would have gotten way too boring without him. Plus it is always fun to ride with a strong racer. Anyways, for basically the entire ride we had a head wind coming at us from the south which made the ride a bit more difficult to handle. My legs were a bit stiff largely from the time spent on the rollers and maybe the car ride and Kent was dealing with getting used to his new bike fit. This guy had a co2 cartridge on his seat to help him find the center and he rode it for at least half the ride. Anyways, I averaged around 238 watts for the three and a half hour ride. But I will say that I really enjoyed getting some good climbs in my legs before VOS. We did the Joe Martin Friday stage route and overall I am really looking forward to the race. I really enjoyed the fun descents, plus the climbing was superb. After the ride Kent fooled me into eating sardines after the ride for “recovery” or something like that. So I tried them and once I was through eating half of it and couldn’t possible digest any more he told me it was a joke. Hahah, pretty funny, the funny thing was they had to deal with me smelling like stupid sardines for the rest of the car ride back to the hotel. Seriously who would eat sardines after a ride? I can’t believe I fell for that one. Well I am going to wrap it up there, I have another fun day planned for tomorrow and I plan on hitting the hay.